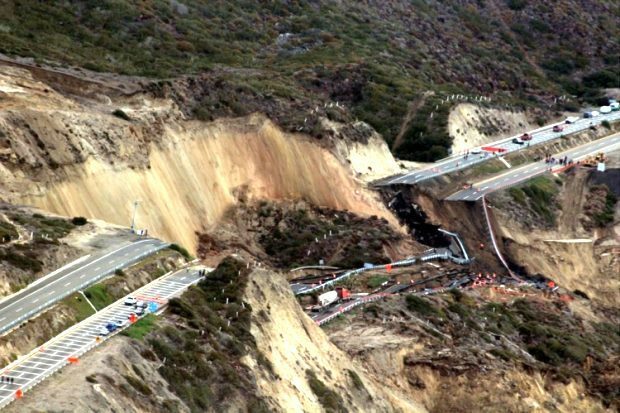 The collapse took place about 95 km (60 mi) south of the border, and closed the scenic coastal highway near the San Miguel toll booth. It is still unclear whether or not an attempt will be made to rebuild the coastal highway, or whether a new highway, or new sections of highway, will be built further inland. In the interim, passenger vehicles and light trucks are using the old two-lane road between Tijuana and Ensenada, while heavy goods vehicles are being rerouted via Tecate, adding at least 30% to their costs, according to Mexican National Confederation of Transporters (MNCT). The MNCT says that 300 trucks a day travel between Tijuana and Ensenada and that the rerouting adds at least 80 km (50 mi) to each trip, with corresponding expenses in gasoline, driver salaries and vehicle maintenance. It also almost doubles the time required. A spokesperson for the MNCT has called for authorities to allow heavy trucks to use the more direct non-toll route (Highway 1). However, the increased traffic on the old road is already leading to backups and an increase in minor accidents, so it is unlikely that authorities will allow any larger trucks to use that route. It is too early to say how serious the effects will be on Ensenada’s economy. The city has Mexico’s third busiest cruise ship terminal and is the main gateway for travel further south along the Baja California Peninsula.